This dish was inspired by a few ideas tossed around on twitter for Taco Tuesday, and while it technically didn't turn out to be a taco I'm crazy about the end result! 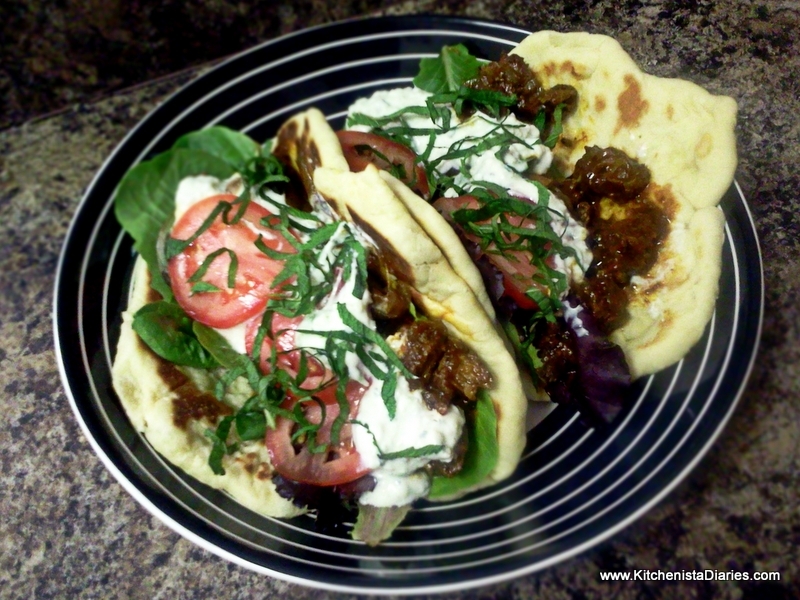 I've never cooked lamb before and really haven't eaten much of it either, but after a couple people recommended lamb tacos I couldn't resist giving it a try. The thing is, I've definitely eyed the small section of lamb cuts at the grocery store every week but with such a hefty price tag it's not the kind of meat that falls into this single mama's budget. As I mentioned in a previous post though, I've been shopping around at some smaller markets lately and found great deals at Penn Dutch. 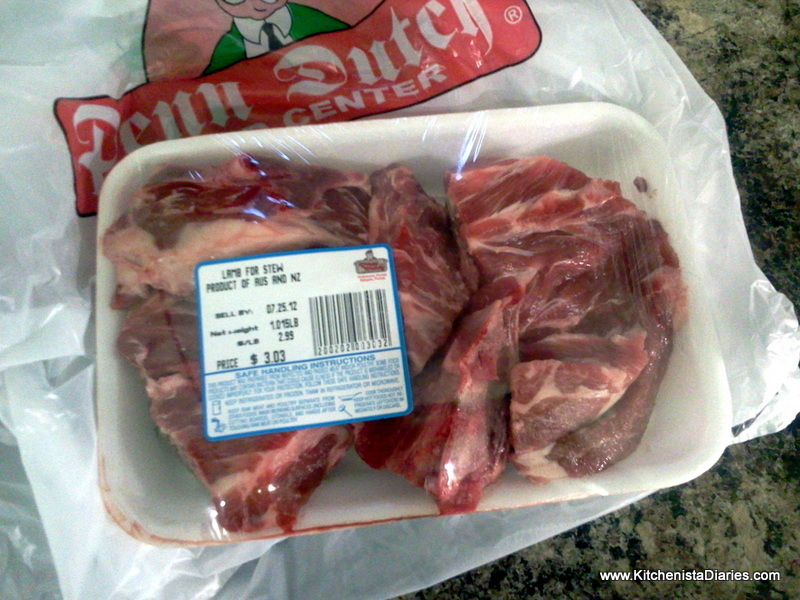 As luck would have it, I found a 1 lb package of lamb meat for stew that was only $3! Clearly the stars had aligned and this dish was meant to happen. So my advice to fellow kitchenistas is not to limit yourself to your local big-chain grocery stores. Often the best deals (and better selection) for meat & seafood are found at independent markets or wholesale stores open to the public. This particular store also has things like duck, goat and rabbit that I definitely can't find at my grocery store, and fresh produce at comparable prices to the farmer's market. The convenience of one stop shopping does come with a price tag, so consider breaking up your grocery list and figuring out various places to get the best deals on items you regularly buy. 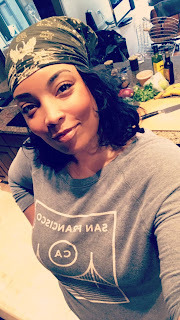 For me personally, I probably make 3 or 4 trips throughout the week to buy food, between the farmer's market, grocery store, Asian food market, and other miscellaneous shops. Sure it's a little bit of running around, but I save money and come across sales that aren't always extended through the weekends. $3/lb - what a deal! As I continue to experiment with new foods, I'm finding that it's getting easier to learn how to trust my instincts in the kitchen. Whereas even a few months ago I would have probably combed through the internet and picked a recipe to cook lamb for the first time, on this night I just did my thing. 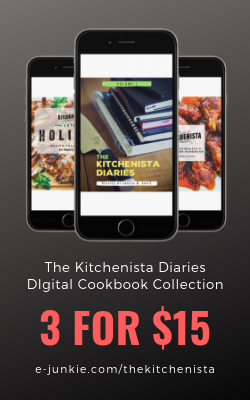 The worst that could happen is having to throw out $3 of meat, right? Between being a fanatic for a good gyro and having cooked quite a few Moroccan dishes, I felt comfortable with how I was going to season the lamb and make a complimentary yogurt sauce. 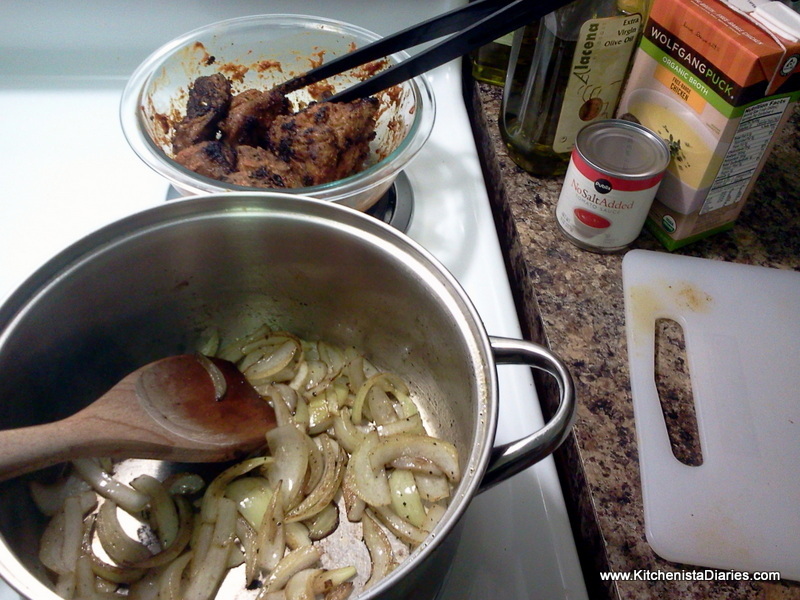 Originally my plan was to use ground lamb, but since all I was able to find was the stew meat, I had to rethink things as I drove home. 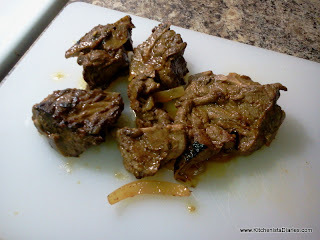 I thought back to how I prepared my beef short ribs, and figured a similar technique should work to get tender pieces of lamb. I called up a new friend, who happens to be a chef, and after bouncing my idea off him I felt pretty good about the direction I was going to take. And you know what? Everything turned out beautifully, and I now have another original recipe under my belt that I couldn't be happier to share with people. So what to take from all of this, whether it's cooking or any other practice, is that it's all about the confidence gained from a continuous progression of learning new skills and building on old skills. 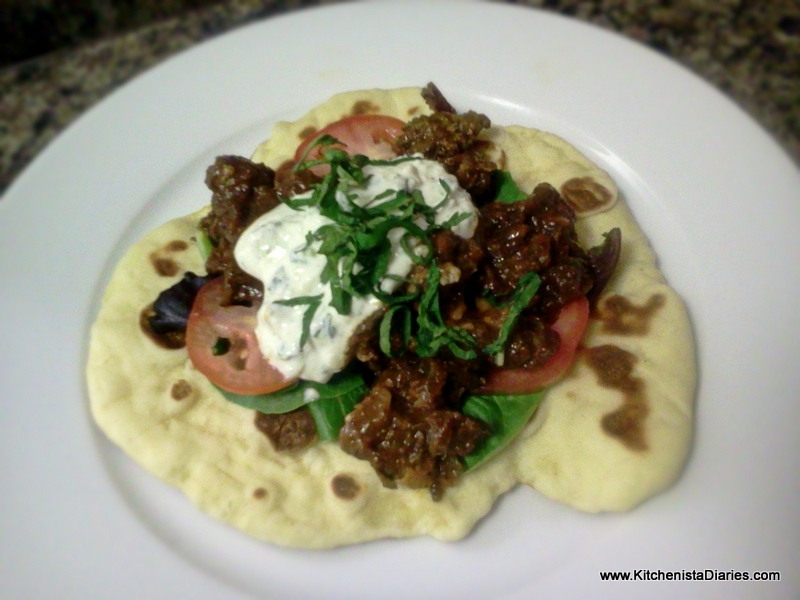 When I took my first bite of this absolutely delicious lamb flatbread, I've gotta say there's nothing like the feeling of pride that came over me as I realized how far I've come and how bright my future will be if I continue to pursue my passion. *Harissa varies in spiciness, so use your best judgment on how much to put in the marinade. 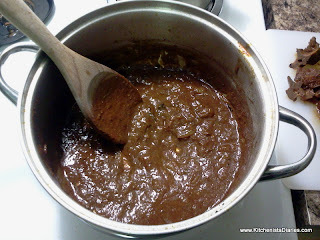 If you can't find Harissa in your grocery store or farmer's market, consider making your own or substitute an Asian chili paste. Rinse lamb pieces and transfer to small bowl. 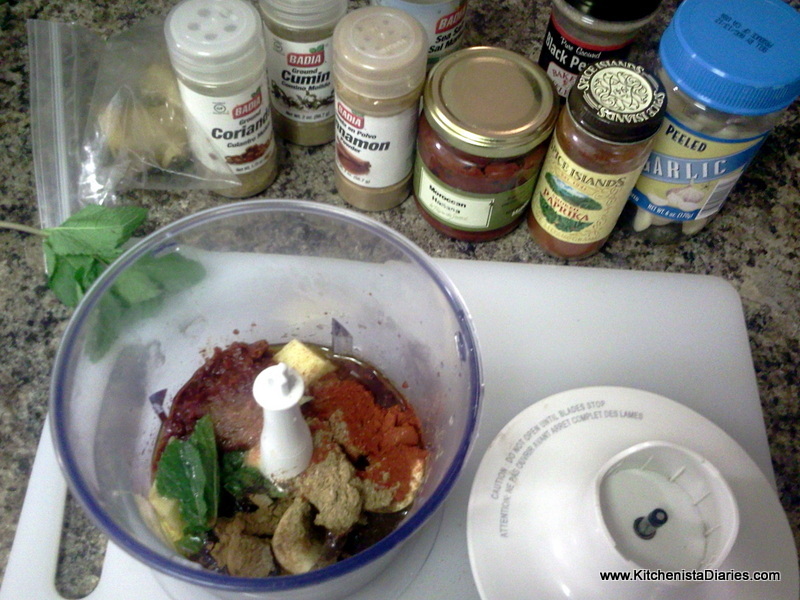 In a food processor, combine half the olive oil, harissa, lemon juice, ginger, garlic, mint, cumin, coriander, smoked paprika, salt and pepper. Blend well. 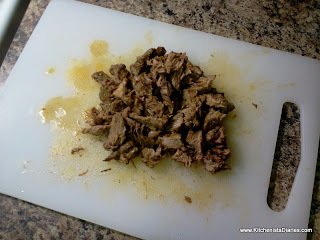 Coat lamb pieces with marinade and refrigerate 30 minutes or up to a couple hours. 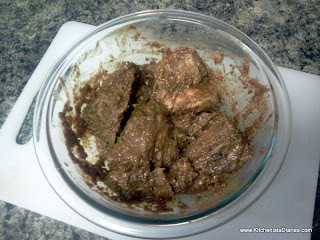 I don't think it would be the end of the world if you didn't marinate the lamb, but if you have time you should. 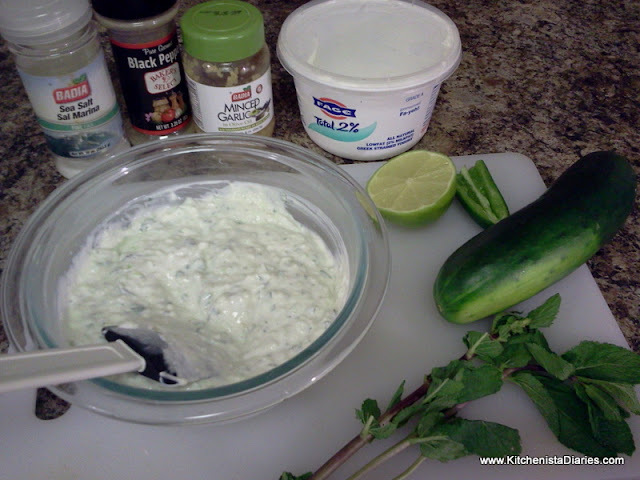 As the lamb marinated, I prepared my Tzatziki sauce, which is essentially a minted jalepeno yogurt dip. I love this sauce on gyros and thought the jalapeño would add a nice kick. Add the peeled and seeded cucumber, mint leaves, garlic, jalapeno and 1/2 the lime juice to a food processor or blender. I had a pretty large jalapeño so I didn't use the whole thing. Pulse, slowly, just to mince the ingredients but not puree. 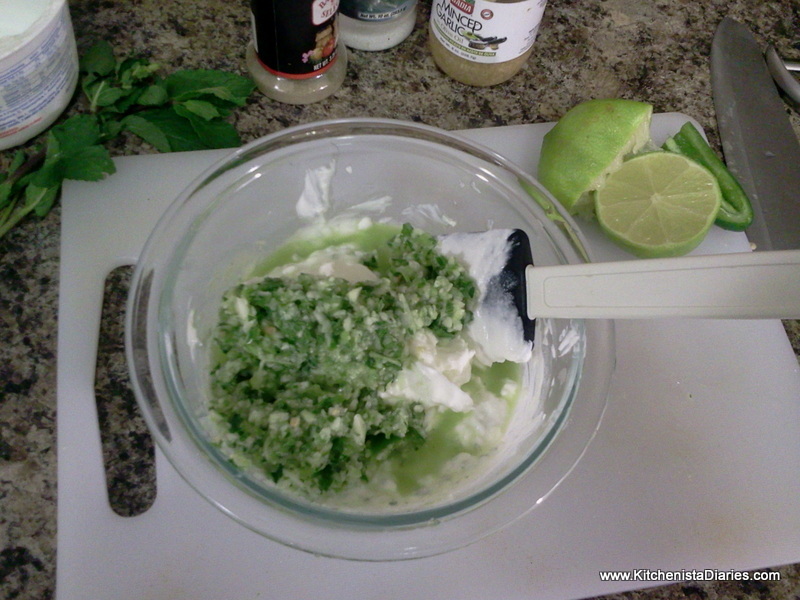 Transfer to a bowl and gently stir in the yogurt. Season to taste with sea salt, pepper and remaining lime juice. Refrigerate until needed. 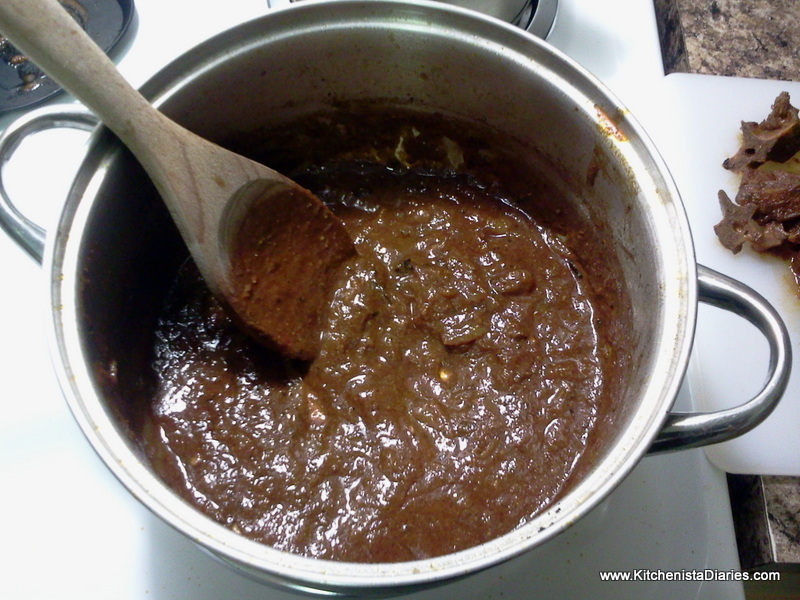 Leftover sauce can be stored in a tightly covered container for a few days, so try it on your salads and sandwiches! 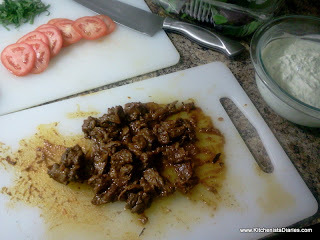 Remove marinated lamb from the fridge. 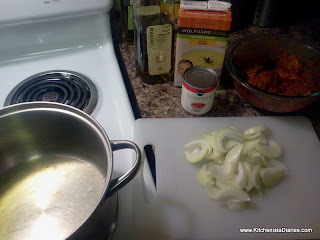 In a large pot or dutch oven over high heat, heat remaining olive oil. Quickly sear the lamb on all sides. Don't crowd the pan; if lamb can't fit in a single layer without touching, sear it in batches. You want to get a nice crust on the outside of the meat. Remove lamb from the pot and cook onions until soft, 3 -4 minutes. 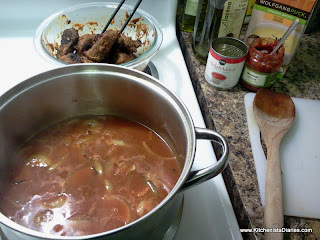 Add chicken broth and tomato sauce, then bring to boil. I added another scoop of Harissa in there, for some extra flavor. Return lamb to the pot. 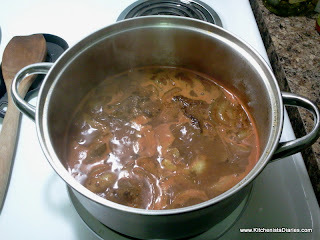 If the liquid does not cover it, add a little water. Cover and reduce heat to low. Cook for 45 to 60 min or until tender. 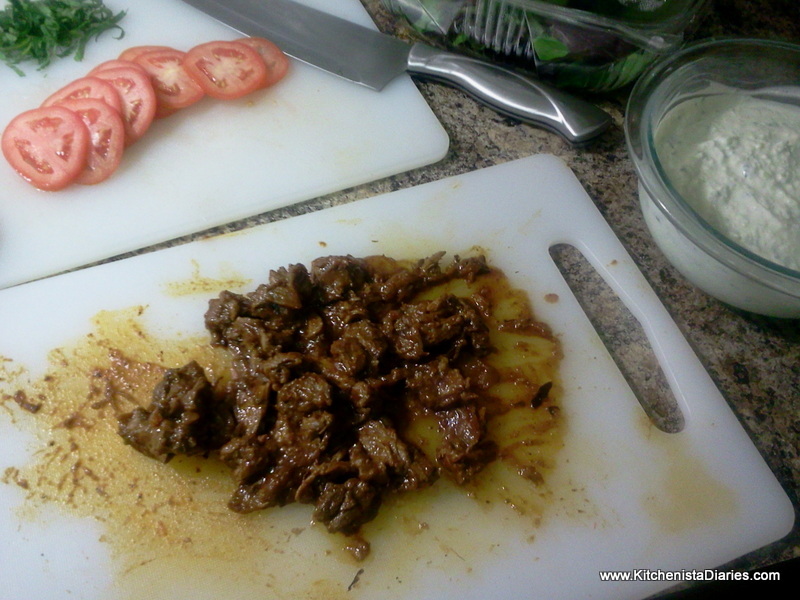 After lamb has cooked, transfer it to a cutting board using a slotted spoon to drain the sauce. Reserve 2 cups of the cooking liquid. Resist the urge to eat the lamb as is. Instead, after allowing lamb to rest for 5-10 minutes, use a good knife to slice lamb into bite-size pieces. Turn off heat. 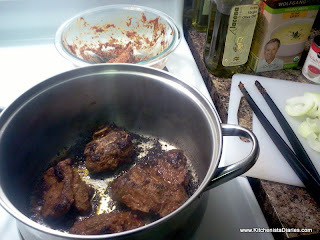 Return the lamb to the pot and coat with sauce prior to serving. I made my own flatbread using a simple recipe I found online. The dough does require time to rise, so factor that into preparing your meal. I thought they were great but it's also the first time I've made my own, so I'll withhold my final verdict until I have more to compare it against. I did think it tasted fresher than store bought, which is what mattered to me. 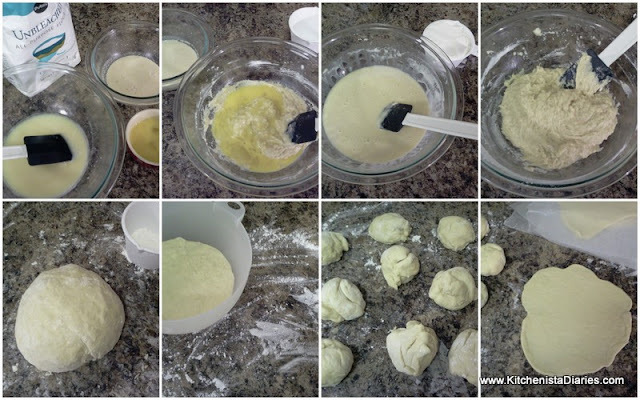 The good thing is that the balls of dough I didn't cook that night could be put in plastic bags and were ready to be rolled out & cooked as needed throughout the rest of the week. 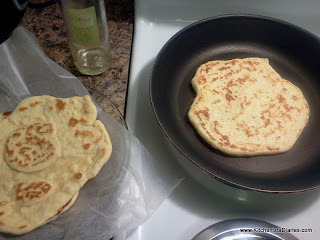 If you didn't make fresh flatbread, you'll want to warm yours prior to serving. Spoon lamb into warm flatbreads and top with lettuce, sliced tomatoes and Tzatziki sauce. 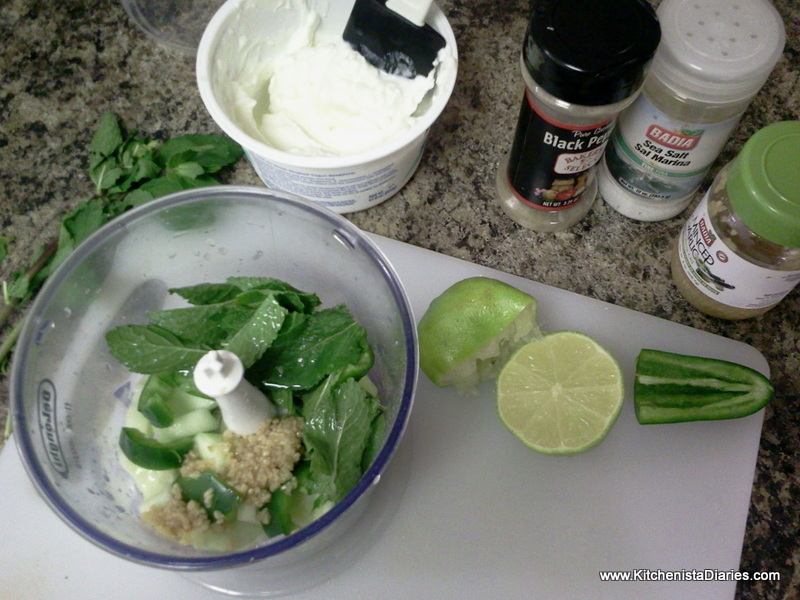 If desired, garnish with fresh mint.